Indicate the number of shares outstanding of each of the registrant’s classes of common stock, as of the latest practicable date. Common Stock ($0.001 par value): As of March 18, 2019, there were 19,310,009 shares outstanding. The accompanying Notes to Unaudited Condensed Consolidated Financial Statements are an integral part of these financial statements. U.S. Gold Corp., formerly known as Dataram Corporation (the “Company”), was originally incorporated in the State of New Jersey in 1967 was subsequently re-incorporated under the laws of the State of Nevada in 2016. Effective June 26, 2017, the Company changed its legal name to U.S. Gold Corp. from Dataram Corporation. On May 23, 2017, the Company merged with Gold King Corp. (“Gold King”), in a transaction treated as a reverse acquisition and recapitalization, and the business of Gold King became the business of the Company. The financial statements are those of Gold King (the accounting acquirer) prior to the merger and include the activity of Dataram Corporation (the legal acquirer) from the date of the merger. Gold King is a gold and precious metals exploration company pursuing exploration and development opportunities primarily in Nevada and Wyoming. None of the Company’s properties contain proven and probable reserves and all of the Company’s activities on all of its properties are exploratory in nature. On July 6, 2016, the Company filed a certificate of amendment to its Articles of Incorporation with the Secretary of State of Nevada in order to effectuate a reverse stock split of the Company’s issued and outstanding common stock per share on a one for three basis, effective on July 8, 2016. Subsequently, on May 3, 2017, the Company filed another certificate of amendment to its Articles of Incorporation, as amended, with the Secretary of State of the State of Nevada in order to effectuate a reverse stock split of the Company’s issued and outstanding common stock on a one for four basis. All share and per share values of the Company’s common stock for all periods presented in the accompanying condensed consolidated financial statements are retroactively restated for the effect of the reverse stock splits. On June 13, 2016, Gold King, a private Nevada corporation, entered into an Agreement and Plan of Merger (the “Merger Agreement”) with the Company, the Company’s wholly-owned subsidiary, Dataram Acquisition Sub, Inc., a Nevada corporation (“Acquisition Sub”), and all of the principal shareholders of Gold King (the “Gold King Shareholders”). Upon closing of the transactions contemplated under the Merger Agreement (the “Merger”), Gold King merged with and into Acquisition Sub with Gold King as the surviving corporation and became a wholly-owned subsidiary of the Company. On May 23, 2017, the Company closed the Merger with Gold King. The Merger constituted a change of control, the majority of the Board of Directors changed with the consummation of the Merger. The Company issued shares of common stock to Gold King which represented approximately 90% of the combined company. On July 31, 2017, the Company’s Board of Directors, or Board, reviewed and approved the recommendation of management to consider strategic options for Dataram Corporation’s legacy business (“Dataram Memory”) including the sale of the legacy business. Upon board approval, the legacy business activities were re-classed and reported as part of “discontinued operations” on the condensed consolidated statements of operations and assets and liabilities were reflected on the condensed consolidated balance sheets as “held for sale”. On October 13, 2017, the Company sold the Dataram Memory business for a price of $900,000 (see Note 7). The accompanying interim unaudited condensed consolidated financial statements have been prepared by the Company in accordance with accounting principles generally accepted in the United States of America, the instructions to Form 10-Q, and the rules and regulations of the United States Securities and Exchange Commission for interim financial information, which includes the unaudited condensed consolidated financial statements and presents the unaudited condensed consolidated financial statements of the Company and its wholly-owned subsidiaries as of January 31, 2019. All intercompany transactions and balances have been eliminated. The accounting policies and procedures used in the preparation of these unaudited condensed consolidated financial statements have been derived from the audited financial statements of the Company for the year ended April 30, 2018, which are contained in the Form 10-K filed on July 30, 2018. The unaudited condensed consolidated balance sheet as of April 30, 2018 was derived from those financial statements. It is management’s opinion that all material adjustments (consisting of normal recurring adjustments) have been made, which are necessary for a fair financial statement presentation. Operating results for the nine-month period ended January 31, 2019 are not necessarily indicative of the results to be expected for the year ending April 30, 2019. In preparing the condensed consolidated financial statements, management is required to make estimates and assumptions that affect the reported amounts of assets and liabilities as of the date of the condensed consolidated balance sheet, and revenues and expenses for the period then ended. Actual results may differ significantly from those estimates. Significant estimates made by management include, but are not limited to valuation of mineral rights, goodwill, stock-based compensation, the fair value of common stock issued, asset retirement obligation and the valuation of deferred tax assets and liabilities. The Company adopted Accounting Standards Codification (“ASC”) ASC 820, “Fair Value Measurements and Disclosures” (“ASC 820”), for assets and liabilities measured at fair value on a recurring basis. ASC 820 establishes a common definition for fair value to be applied in accordance with accounting principles generally accepted in the United States of America that requires the use of fair value measurements, establishes a framework for measuring fair value and expands disclosure about such fair value measurements. ASC 820 defines fair value as the price that would be received to sell an asset or paid to transfer a liability in an orderly transaction between market participants at the measurement date. Additionally, ASC 820 requires the use of valuation techniques that maximize the use of observable inputs and minimize the use of unobservable inputs. The Company analyzes all financial instruments with features of both liabilities and equity under the Financial Accounting Standard Board’s (“FASB”) accounting standard for such instruments. Under this standard, financial assets and liabilities are classified in their entirety based on the lowest level of input that is significant to the fair value measurement. The carrying amounts reported in the unaudited condensed consolidated balance sheets for cash, prepaid expense and other current assets – current, accounts payable, and accrued liabilities, approximate their estimated fair values based on the short-term maturity of these instruments. 3. Significant negative industry or economic trends. When the Company determines that the carrying value of intangibles may not be recoverable based upon the existence of one or more of the above indicators of impairment and the carrying value of the asset cannot be recovered from projected undiscounted cash flows, the Company records an impairment charge. The Company measures any impairment based on a projected discounted cash flow method using a discount rate determined by management to be commensurate with the risk inherent in the current business model. Significant management judgment is required in determining whether an indicator of impairment exists and in projecting cash flows. Property is carried at cost. The cost of repairs and maintenance is expensed as incurred; major replacements and improvements are capitalized. When assets are retired or disposed of, the cost and accumulated depreciation are removed from the accounts, and any resulting gains or losses are included in income in the year of disposition. Depreciation is calculated on a straight-line basis over the estimated useful life of the assets, generally ten years. The Company reviews long-lived assets for impairment whenever events or changes in circumstances indicate that the carrying amount of the assets may not be fully recoverable, or at least annually. The Company recognizes an impairment loss when the sum of expected undiscounted future cash flows is less than the carrying amount of the asset. The amount of impairment is measured as the difference between the asset’s estimated fair value and its book value. During the year ended April 30, 2018, the Company determined that the carrying value of Goodwill (see Note 6) exceeded its fair value, which triggered an impairment analysis. The Company recorded a goodwill impairment expense of $6,094,760 during the year ended April 30, 2018, nonrecurring level 3 fair value measurement. No impairment of goodwill was recorded during the nine months ended January 31, 2019. Costs of lease, exploration, carrying and retaining unproven mineral lease properties are expensed as incurred. The Company expenses all mineral exploration costs as incurred as it is still in the exploration stage. If the Company identifies proven and probable reserves in its investigation of its properties and upon development of a plan for operating a mine, it would enter the development stage and capitalize future costs until production is established. When a property reaches the production stage, the related capitalized costs are amortized on a units-of-production basis over the proven and probable reserves following the commencement of production. The Company assesses the carrying costs of the capitalized mineral properties for impairment under ASC 360-10, “Impairment of long-lived assets”, and evaluates its carrying value under ASC 930-360, “Extractive Activities - Mining”, annually. An impairment is recognized when the sum of the expected undiscounted future cash flows is less than the carrying amount of the mineral properties. Impairment losses, if any, are measured as the excess of the carrying amount of the mineral properties over its estimated fair value. To date, the Company has not established the commercial feasibility of any exploration prospects; therefore, all exploration costs are being expensed. ASC 930-805, “Extractive Activities-Mining: Business Combinations” (“ASC 930-805”), states that mineral rights consist of the legal right to explore, extract, and retain at least a portion of the benefits from mineral deposits. Mining assets include mineral rights. Acquired mineral rights are considered tangible assets under ASC 930-805. ASC 930-805 requires that mineral rights be recognized at fair value as of the acquisition date. As a result, the direct costs to acquire mineral rights are initially capitalized as tangible assets. Mineral rights include costs associated with acquiring patented and unpatented mining claims. ● The value beyond proven and probable reserves (“VBPP”) to the extent that a market participant would include VBPP in determining the fair value of the assets. ● The effects of anticipated fluctuations in the future market price of minerals in a manner that is consistent with the expectations of market participants. Share-based compensation is accounted for based on the requirements of ASC 718, “Compensation – Stock Compensation’ (“ASC 718”) which requires recognition in the financial statements of the cost of employee and director services received in exchange for an award of equity instruments over the period the employee or director is required to perform the services in exchange for the award (presumptively, the vesting period). ASC 718 also requires measurement of the cost of employee and director services received in exchange for an award based on the grant-date fair value of the award. Pursuant to ASC 505, “Equity – Equity Based Payments to Non-Employees” (“ASC 505-50”), for share-based payments to consultants and other third-parties, compensation expense is determined at the measurement date which is the grant date. Until the measurement date is reached, the total amount of compensation expense remains uncertain. In June 2018, the FASB issued ASU 2018-07, “Compensation — Stock Compensation (Topic 718): Improvements to Nonemployee Share-Based Payment Accounting”, which expands the scope of Topic 718 to include all share-based payment transactions for acquiring goods and services from nonemployees. ASU 2018-07 specifies that Topic 718 applies to all share-based payment transactions in which the grantor acquires goods and services to be used or consumed in its own operations by issuing share-based payment awards. ASU 2018-07 also clarifies that Topic 718 does not apply to share-based payments used to effectively provide (1) financing to the issuer or (2) awards granted in conjunction with selling goods or services to customers as part of a contract accounted for under ASC 606. ASU 2018-07 is effective for fiscal years beginning after December 15, 2018, including interim periods within those fiscal years, with early adoption permitted, but no earlier than adoption of ASC 606. The Company chose to early adopt ASU 2018-07 in July 2018. The adoption of this standard did not have a material impact on the Company’s unaudited condensed consolidated financial statements and related disclosures. The Company classifies as equity any contracts that (i) require physical settlement or net-share settlement or (ii) gives the Company a choice of net-cash settlement or settlement in its own shares (physical settlement or net-share settlement). The Company classifies as assets or liabilities any contracts that (i) require net-cash settlement (including a requirement to net-cash settle the contract if an event occurs and if that event is outside the control of the Company) or (ii) gives the counterparty a choice of net-cash settlement or settlement in shares (physical settlement or net-share settlement). The Company assessed the classification of its common stock purchase warrants as of the date of each equity offering and determined that such instruments met the criteria for equity classification, as the settlement terms indicate that the instruments are indexed to the entity’s underlying stock. The Company accounts for its convertible preferred stock under the provisions of ASC 480, “Distinguishing Liabilities from Equity”, which sets forth the standards for how an issuer classifies and measures certain financial instruments with characteristics of both liabilities and equity. ASC 480 requires an issuer to classify a financial instrument that is within the scope of ASC 480 as a liability if such financial instrument embodies an unconditional obligation to redeem the instrument at a specified date and/or upon an event certain to occur. The Company bifurcates conversion options from their host instruments and account for them as free standing derivative financial instruments according to certain criteria. The criteria includes circumstances in which (a) the economic characteristics and risks of the embedded derivative instrument are not clearly and closely related to the economic characteristics and risks of the host contract, (b) the hybrid instrument that embodies both the embedded derivative instrument and the host contract is not re-measured at fair value under otherwise applicable generally accepted accounting principles with changes in fair value reported in earnings as they occur and (c) a separate instrument with the same terms as the embedded derivative instrument would be considered a derivative instrument. An exception to this rule when the host instrument is deemed to be conventional as that term is described under applicable U.S. GAAP. When the Company has determined that the embedded conversion options should not be bifurcated from their host instruments, the Company records, when necessary, a beneficial conversion feature (“BCF”) related to the issuance of convertible debt and equity instruments that have conversion features at fixed rates that are in-the-money when issued, and the fair value of warrants issued in connection with those instruments. The BCF for the convertible instruments is recognized and measured by allocating a portion of the proceeds to warrants, based on their relative fair value, and as a reduction to the carrying amount of the convertible instrument equal to the intrinsic value of the conversion feature. The discounts recorded in connection with the BCF and warrant valuation are recognized a) for convertible debt as interest expense over the term of the debt, using the effective interest method or b) for convertible preferred stock as dividends at the time the stock first becomes convertible. Asset retirement obligations (“ARO”), consisting primarily of estimated reclamation costs at the Company’s Copper King and Keystone properties, are recognized in the period incurred and when a reasonable estimate can be made, and recorded as liabilities at fair value. Such obligations, which are initially estimated based on discounted cash flow estimates, are accreted to full value over time through charges to accretion expense. Corresponding asset retirement costs are capitalized as part of the carrying amount of the related long-lived asset and depreciated over the asset’s remaining useful life. Asset retirement obligations are periodically adjusted to reflect changes in the estimated present value resulting from revisions to the estimated timing or amount of reclamation and closure costs. The Company reviews and evaluates its asset retirement obligations annually or more frequently at interim periods if deemed necessary. The Company accounts for income taxes pursuant to the provision of ASC 740-10, “Accounting for Income Taxes” (“ASC 740-10”), which requires, among other things, an asset and liability approach to calculating deferred income taxes. The asset and liability approach requires the recognition of deferred tax assets and liabilities for the expected future tax consequences of temporary differences between the carrying amounts and the tax bases of assets and liabilities. A valuation allowance is provided to offset any net deferred tax assets for which management believes it is more likely than not that the net deferred asset will not be realized. The Company follows the provision of ASC 740-10 related to Accounting for Uncertain Income Tax Positions. When tax returns are filed, there may be uncertainty about the merits of positions taken or the amount of the position that would be ultimately sustained. In accordance with the guidance of ASC 740-10, the benefit of a tax position is recognized in the financial statements in the period during which, based on all available evidence, management believes it is more likely than not that the position will be sustained upon examination, including the resolution of appeals or litigation processes, if any. Tax positions taken are not offset or aggregated with other positions. Tax positions that meet the more likely than not recognition threshold are measured at the largest amount of tax benefit that is more than 50 percent likely of being realized upon settlement with the applicable taxing authority. The portion of the benefit associated with tax positions taken that exceed the amount measured as described above should be reflected as a liability for uncertain tax benefits in the accompanying balance sheet along with any associated interest and penalties that would be payable to the taxing authorities upon examination. The Company believes its tax positions are all more likely than not to be upheld upon examination. As such, the Company has not recorded a liability for uncertain tax benefits. The Company has adopted ASC 740-10-25, “Definition of Settlement”, which provides guidance on how an entity should determine whether a tax position is effectively settled for the purpose of recognizing previously unrecognized tax benefits and provides that a tax position can be effectively settled upon the completion and examination by a taxing authority without being legally extinguished. For tax positions considered effectively settled, an entity would recognize the full amount of tax benefit, even if the tax position is not considered more likely than not to be sustained based solely on the basis of its technical merits and the statute of limitations remains open. The federal and state income tax returns of the Company are subject to examination by the IRS and state taxing authorities, generally for three years after they are filed. The Tax Cuts and Jobs Act (the “Act”) was enacted in December 2017. Among other things, the Act reduced the U.S. federal corporate tax rate from 34 percent to 21 percent as of January 1, 2018 and eliminated the alternative minimum tax (“AMT”) for corporations. Since the deferred tax assets are expected to reverse in a future year, it has been tax effected using the 21% federal corporate tax rate. As a result of the reduction in the corporate tax rate, the Company decreased its gross deferred tax assets by approximately $2.1 million which was offset by a corresponding decrease to the valuation allowance as of April 30, 2018, which had no impact on the Company’s consolidated financial statements for the year ended April 30, 2018. The Company will continue to analyze the Tax Act to assess its full effects on the Company’s financial results, including disclosures, for the Company’s fiscal year ending April 30, 2019, but the Company does not expect the Tax Act to have a material impact on the Company’s unaudited condensed consolidated financial statements. On December 22, 2017, the Securities and Exchange Commission issued Staff Accounting Bulletin 118, which allows a measurement period, not to exceed one year, to finalize the accounting for the income tax effects of the Act. Until the accounting for the income tax effects of the Act is complete, the reported amounts are based on reasonable estimates, are disclosed as provisional and reflect any adjustments in subsequent periods as estimates are refined or the accounting of the tax effects are completed. During the quarter ended January 31, 2019, the Company established a valuation allowance of $438,145 to offset any previously recognized net deferred tax assets for which management believes it is more likely than not that the net deferred asset will not be realized. In February 2016, the FASB established Topic 842, “Leases”, by issuing Accounting Standards Update (“ASU”) No. 2016-02, which requires lessees to recognize leases on-balance sheet and disclose key information about leasing arrangements. Topic 842 was subsequently amended by ASU No. 2018-01, “Land Easement Practical Expedient for Transition to Topic 842”; ASU No. 2018-10, “Codification Improvements to Topic 842, Leases”; and ASU No. 2018-11, “Targeted Improvements”. The new standard establishes a right-of-use model (ROU) that requires a lessee to recognize a ROU asset and lease liability on the balance sheet for all leases with a term longer than 12 months. Leases will be classified as finance or operating, with classification affecting the pattern and classification of expense recognition in the income statement. The new standard is effective for the Company on May 1, 2019, with early adoption permitted. The Company expects to adopt the new standard on its effective date. A modified retrospective transition approach is required, applying the new standard to all leases existing at the date of initial application. An entity may choose to use either (1) its effective date or (2) the beginning of the earliest comparative period presented in the financial statements as its date of initial application. If an entity chooses the second option, the transition requirements for existing leases also apply to leases entered into between the date of initial application and the effective date. The entity must also recast its comparative period financial statements and provide the disclosures required by the new standard for the comparative periods. The Company expects to adopt the new standard on May 1, 2019 and use the effective date as the date of initial application. Consequently, financial information will not be updated and the disclosures required under the new standard will not be provided for dates and periods before May 1, 2019. While the Company is assessing the effects of adoption, it currently believes the most significant effects relate to the recognition of new ROU assets and lease liabilities on its balance sheet for mineral property operating leases and providing significant new disclosures about our leasing activities. The Company does not expect a significant change in its leasing activities between now and adoption. Other accounting standards that have been issued or proposed by FASB that do not require adoption until a future date are not expected to have a material impact on the financial statements upon adoption. The Company does not discuss recent pronouncements that are not anticipated to have an impact on or are unrelated to its financial condition, results of operations, cash flows or disclosures. The accompanying condensed consolidated financial statements have been prepared on a going concern basis, which contemplates the realization of assets and the satisfaction of liabilities in the normal course of business. The Company has incurred significant operating losses since its inception. As of January 31, 2019, the Company had cash of approximately $3.2 million, working capital of approximately $3.2 million, an accumulated deficit of approximately $24.8 million, and cash used in operating activities of approximately $4.6 million. As a result of the utilization of cash in its operating activities, and the development of its assets, the Company has incurred losses since it commenced operations. The Company’s primary source of operating funds since inception has been equity financings. These matters raise substantial doubt about the Company’s ability to continue as a going concern for the twelve months following the issuance of these financial statements. The condensed consolidated financial statements do not include any adjustments relating to the recoverability and classification of asset amounts or the classification of liabilities that might be necessary should the Company be unable to continue as a going concern. The Company consummated private placements to several investors for the sale of the Company’s Series B Convertible Preferred Stock (“Series B Preferred Stock”) and Series C Convertible Preferred Stock (“Series C Preferred Stock”) for aggregate net proceeds of approximately $10.9 million between July 2016 and October 2016, received net proceeds from sale of the Company’s common stock of approximately $2.6 million between July 2017 and October 2017 and completed a private placement for the sale of the Company’s Series E Convertible Preferred Stock (“Series E Preferred Stock”) and warrants for aggregate net proceeds of approximately $4.9 million in January 2018. All preferred shares were converted to common shares during the fiscal year ended April 30, 2018. On November 2, 2018, the Company entered into an At-the-Market Offering Agreement (the “ATM Agreement”) with H.C. Wainwright & Co., LLC (“Wainwright”) as sales manager. Under the terms of the ATM Agreement, the Company will be entitled to sell, at its sole discretion and from time to time as it may choose, common shares in the capital of the Company (“Shares”) through Wainwright, with such sales having an aggregate gross sales value of up to $1,000,000 (the “Offering”). Subject to the terms and conditions of the ATM Agreement, Wainwright will use its commercially reasonable efforts to sell the Shares from time to time, based upon the Company’s instructions. The Company has provided Wainwright with customary indemnification rights, and Wainwright will be entitled to a commission at a fixed commission rate equal to 3.0% of the gross proceeds per Share sold. The ATM Agreement will remain in full force and effect until the ATM Agreement is terminated. For the quarter ended January 31, 2019, the Company has sold 235,071 shares and raised a net of $178,872, net of issuance costs of $60,300, through the ATM Agreement at prices per share averaging $1.02. There can be no assurance that the Company will be able to raise additional capital or if the terms will be favorable. The mineral properties consist of the Copper King gold and copper development project located in the Silver Crown Mining District of southeast Wyoming (the “Copper King Project”). On July 2, 2014, the Company entered into an Asset Purchase Agreement whereby the Company acquired certain mining leases and other mineral rights comprising the Copper King project. The purchase price was (a) cash payment in the amount of $1.5 million and (b) closing shares calculated at 50% of the issued and outstanding shares of the Company’s common stock and valued at $1.5 million. In accordance with ASC 360-10, “Property, Plant, and Equipment”, assets are recognized based on their cost to the acquiring entity, which generally includes the transaction costs of the asset acquisition. Accordingly, the Company recorded a total cost of the acquired mineral properties of $3,091,738 which includes the purchase price ($3,000,000) and related transaction cost. The Company, through its wholly-owned subsidiary, U.S. Gold Acquisition Corp., acquired the mining claims comprising the Keystone Project on May 27, 2016 from Nevada Gold Ventures, LLC (“Nevada Gold”) and Americas Gold Exploration, Inc. under the terms of a Purchase and Sale Agreement. At the time of purchase, the Keystone Project consisted of 284 unpatented lode mining claims situated in Eureka County, Nevada. The purchase price for the Keystone Project consisted of the following: (a) cash payment in the amount of $250,000, (b) the closing shares which is equivalent to 462,500 shares of the Company’s common stock and (c) an aggregate of 231,458 five-year options to purchase shares of the Company’s common stock at an exercise price of $3.60 per share. The Company valued the common shares at the fair value of $555,000 or $1.20 per common share based on the contemporaneous sale of its preferred stock in a private placement at $0.10 per common share. The options were valued at $184,968. The options shall vest over a period of two years whereby 1/24 of the options shall vest and become exercisable each month for the next 24 months. The options are non-forfeitable and are not subject to obligations or service requirements. Accordingly, the Company recorded a total cost of the acquired mineral properties of $1,028,885 which includes the purchase price ($989,968) and related transaction cost ($38,917). Some of the Keystone Project claims are subject to pre-existing net smelter royalty (“NSR”) obligations. In addition, under the terms of the Purchase and Sale Agreement, Nevada Gold retained additional NSR rights of 0.5% with regard to certain claims and 3.5% with regard to certain other claims. Under the terms of the Purchase and Sale Agreement, the Company may buy down one percent (1%) of the royalty from Nevada Gold at any time through the fifth anniversary of the closing date for $2,000,000. In addition, the Company may buy down an additional one percent (1%) of the royalty anytime through the eighth anniversary of the closing date for $5,000,000. In August 2017, the Company closed on a transaction under a purchase and sale agreement executed in June 2017 with Nevada Gold and the Company’s wholly-owned subsidiary, U.S. Gold Acquisition Corporation, a Nevada corporation, pursuant to which Nevada Gold sold and U.S. Gold Acquisition Corporation purchased all right, title and interest in the Gold Bar North Property, a gold development project located in Eureka County, Nevada. The purchase price for the Gold Bar North Property was: (a) cash payment in the amount of $20,479 which was paid in August 2017 and (b) 15,000 shares of common stock of the Company which were issued in August 2017 valued at $35,850. Mr. David Mathewson, the Company’s Chief Geologist, is a member of Nevada Gold. As of the date of these condensed consolidated financial statements, the Company has not established any proven or probable reserves on its mineral properties and has incurred only acquisition costs and exploration costs. For the nine months ended January 31, 2019 and 2018, depreciation expense amounted to $4,602 and $0, respectively. In conjunction with various permit approvals permitting the Company to undergo exploration activities at the Copper King project and Keystone project, the Company has recorded an asset retirement obligation based upon the reclamation plans submitted in connection with the various permits. On May 23, 2017, the Company closed the Merger with Gold King. Pursuant to the terms of the Merger Agreement and as consideration for the acquisition of Gold King, on the closing date, 2,446,433 shares of the Company’s common stock, par value $0.001 per share, were issued to holders of Gold King’s common stock, Series A Preferred Stock, Series B Preferred Stock and certain incoming officers. In addition, 45,000.18 shares of the Company’s newly designated Series C Preferred Stock, par value $0.001 per share, convertible into an aggregate of 4,500,180 shares of the Company’s common stock were issued to Copper King LLC, 45,500.18 shares of Series C Preferred Stock were issued to Copper King LLC upon closing, 4,500.01 shares of Series C Preferred Stock were to be held in escrow pursuant to the terms of an escrow agreement and 4,523,589 shares of the Company’s common stock and warrants to purchase up to 452,359 shares of the Company’s common stock were issued to the holders of Gold King’s Series C Preferred Stock. Additionally, 231,458 of the Company’s stock options were issued to the holders of Gold King’s outstanding stock options issued in connection with the closing of the acquisition of the Keystone Project. As a result of the Merger, for financial statement reporting purposes, the business combination between the Company and Gold King has been treated as a reverse acquisition and recapitalization with Gold King deemed the accounting acquirer and the Company deemed the accounting acquiree under the acquisition method of accounting in accordance with FASB Accounting Standards Codification (“ASC”) Section 805-10-55. At the time of the Merger, both the Company and Gold King have their own separate operating segments. Accordingly, the assets and liabilities and the historical operations that are reflected in the consolidated financial statements after the Merger are those of the Gold King and are recorded at the historical cost basis of the Company. The acquisition process utilizes the capital structure of the Company and the assets and liabilities of Gold King which are recorded at historical cost. The Company’s assets and liabilities were recorded at their fair values as of the date of the Merger and the results of operations of the Company are consolidated with results of operations of Gold King starting on the date of the Merger. The Company is deemed to have issued 1,204,667 shares of common stock which represents the outstanding common stock of the Company prior to the closing of the Merger. The Company accounted for the value under ASC 805-50-30-2 “Business Combinations” whereby if the consideration is not in the form of cash, the measurement is based on either the cost which shall be measured based on the fair value of the consideration given or the fair value of the assets (or net assets) acquired, whichever is more clearly evident and thus more reliably measurable. The Company deemed that the fair value of the consideration given was $4.70 per share based on the quoted trading price on the date of the Merger amounting to $5,661,935 which is a more reliable measurement basis. The estimated fair values of assets acquired and liabilities assumed are provisional and are based on the information that was available as of the acquisition date to estimate the fair value of assets acquired and liabilities assumed. The Company believes that information provides a reasonable basis for estimating the fair values of assets acquired and liabilities assumed. During the year ended April 30, 2018, the Company recorded an impairment loss of $6,094,760 as the Company determined that the carrying value of the goodwill was not recoverable. The Company determined that if the business combination would have occurred on the first day of the reporting period, there would not have been a material change to the continuing operations of the financial statements presented. In June 2017, subsequent to the Merger, the Company decided to discontinue its memory product business. The Company sold the Dataram Memory business on October 13, 2017 for a purchase price of $900,000. The Company will focus its activities on its gold and precious metal exploration business. During the year ended April 30, 2018, the Company received net proceeds from the sale of Dataram Memory business of $326,404 after payment of fees related to the sale such as legal and commission expenses and other liabilities assumed. During the year ended April 30, 2018, the Company recognized a gain on extinguishment of liabilities of $248,684 which is included in the loss from discontinued operations as the Company has settled the distribution payable to the former Dataram Memory shareholders at an amount less than the liability originally recorded at the time of acquisition. Additionally, during the year ended April 30, 2018, the Company recognized gain from sale of discontinued operations of $94,485 related to the sale of the Dataram Memory business on October 13, 2017. The Company had a financing agreement (the “Financing Agreement”) with Rosenthal & Rosenthal, Inc. that provides for a revolving loan with a maximum borrowing capacity of $3,500,000. The Financing Agreement renewal date was August 31, 2017 and will renew from year to year unless such Financing Agreement is terminated as set forth in the loan agreement. The amount outstanding under the Financing Agreement bore interest at a rate of the Prime Rate (as defined in the Financing Agreement) plus 3.25% (the “Effective Rate”) or on Over-advances (as defined in the Financing Agreement), if any, at a rate of the Effective Rate plus 3%. The Financing Agreement contained other financial and restrictive covenants, including, among others, covenants limiting the Company’s ability to incur indebtedness, guarantee obligations, sell assets, make loans, enter into mergers and acquisition transactions and declare or make dividends. Borrowings under the Financing Agreement are collateralized by substantially all the assets of the Company. The Financing Agreement provided for advances against eligible accounts receivable and inventory balances based on prescribed formulas of raw materials and finished goods. On October 13, 2017, upon the sale of the Dataram Memory business, the buyer assumed the obligation under this Financing Agreement, therefore, liabilities related to this financing agreement was $0 as of April 30, 2018. The following table sets forth for the year ended April 30, 2018, indicated selected financial data of the Company’s discontinued operations of its memory product business from the date of merger to April 30, 2018. The following table sets forth for the year ended April 30, 2018, indicated selected financial data of the Company’s gain from sale of the Dataram Memory business. Accounts payable to related party as of January 31, 2019 and April 30, 2018 was $31,520, and $2,431 respectively and was reflected as accounts payable – related party in the accompanying unaudited condensed consolidated balance sheets. The related parties are a member of the Board of Directors owed $12,500, the Vice President-Head of Exploration owed $12,500 in stock and the Chief Financial Officer owed $6,520 at January 31, 2019. In August 2017, the Company’s Board of Directors approved the Company’s 2017 Equity Incentive Plan (the “Plan”) including the reservation of 1,650,000 shares of common stock thereunder. On January 1st of each year during the term of the Plan (the “Calculation Date”), the aggregate number of shares of Common Stock that are available for issuance shall automatically be increased by such number of shares as is equal to the number of shares sufficient to cause the Share Limit (as defined in the Plan) to equal twenty percent (20%) of the issued and outstanding Common Stock of the Company at such time, provided, however, that if on any Calculation Date the number of shares equal twenty percent (20%) of our total issued and outstanding Common Stock is less than the number of shares of Common Stock available for issuance under the Plan, no change will be made to the aggregate number of shares of Common Stock issuable under the Plan for that year (such that the aggregate number of shares of Common Stock available for issuance under the Plan will never decrease). In May 2017, in connection with the Merger (see Note 7), the Company issued 37,879 shares of the Company’s common stock having a fair value of $100,000 to the Chief Geologist for services rendered to the Company from June 2016 to January 2017 pursuant to his employment agreement with the Company’s wholly-owned subsidiary Gold King (see Note 11). Consequently, the Company reduced accrued salaries by $100,000 as of July 31, 2017. In July 2017, the Company sold 179,211 shares of its common stock at $2.79 per common share for proceeds of approximately $500,000. Between May 2017 and July 2017, the Company issued 3,682,000 shares of the Company’s common stock in exchange for the conversion of 36,820 shares of the Company’s Series C Preferred Stock. On November 2, 2018, the Company entered into an At-the-Market Offering Agreement (the “ATM Agreement”) with H.C. Wainwright & Co., LLC (“Wainwright”) as sales manager. Under the terms of the ATM Agreement, the Company will be entitled to sell, at its sole discretion and from time to time as it may choose, common stock of the Company (“Shares”) through Wainwright, with such sales having an aggregate gross sales value of up to $1,000,000 (the “Offering”). Subject to the terms and conditions of the ATM Agreement, Wainwright will use its commercially reasonable efforts to sell the Shares from time to time, based upon the Company’s instructions. The Company has provided Wainwright with customary indemnification rights, and Wainwright will be entitled to a commission at a fixed commission rate equal to 3.0% of the gross proceeds per Share sold. The ATM Agreement will remain in full force and effect until the ATM Agreement is terminated. For the quarter ended January 31, 2019, the Company sold 235,071 Shares and raised a net of $178,872, net of issuance costs of $60,300, through the ATM Agreement at prices per share averaging $1.02. During the nine months ended January 31, 2019, the Company issued 91,268 shares of the Company’s common stock to the Chief Geologist for services rendered to the Company from May 2018 to January 2019 pursuant to his employment agreement (see Note 11). The Company valued these common shares at the fair value of $100,000, or $0.93 - $1.36 per common share based on the quoted trading prices on the date of grants. During the nine months ended January 31, 2019, the Company paid an accrued service liability in the amount of $12,500 by issuing 9,191 shares of common stock at a price of $1.36 per share. On September 30, 2018, the Company issued an aggregate of 1,000,000 shares of the Company’s common stock to officers, directors, employees and consultants for services rendered. The shares vest 50% on the date of issuance and 50% on the one-year anniversary of the date of issuance. The 1,000,000 shares had a fair value of $990,000 and will be expensed over the vesting period. Additionally, on November 10, 2017, 12,000 shares was issued to a director that vest two years from issue date, and on February 20, 2018, 150,000 shares was issued to a consultant that vest ratably over 12 months, bringing the total of restricted shares issued to 1,162,000. A total of $138,332 and $798,977 was expensed for the three- and nine-month periods ended January 31, 2019. On December 31, 2018, the Company paid a portion of its accounts payable to a vendor, in the amount of $183,226 by issuing 199,159 shares of common stock at the closing price on December 27, 2018 of $0.92 per share. During the nine months ended January 31, 2019, the Company has recorded $1,136,458 to the condensed consolidated statements of operations relating to common stock issued for services. A balance of $311,915 remains to be expensed over future vesting periods. On December 21, 2017, the Company issued four employees an aggregate of 925,000 common stock options for services, having a total fair value of approximately $878,000. 231,250 of the options vest immediately, 231,250 vest on December 21, 2018, 231,250 vest on December 21, 2019 and 231,250 vest on December 21, 2020. These options expire on December 21, 2022. These options have an exercise price of $1.47 per share. Of these options, 37,500 unvested options were forfeited with the departure of an employee on May 1, 2018. On December 21, 2017, the Company issued four board members an aggregate of 200,000 common stock options for services, having a total fair value of approximately $170,000. 100,000 of the options vest immediately and 100,000 vest on December 21, 2018. These options expire on December 21, 2022. These options have an exercise price of $1.47 per share. On December 21, 2017, the Company issued three consultants an aggregate of 75,000 common stock options for services, having a total grant date fair value of approximately $76,000. 18,750 of the options vest immediately, 18,750 vest on December 21, 2018, 18,750 vest on December 21, 2019 and 18,750 vest on December 21, 2020. These options expire on December 21, 2022. These options have an exercise price of $1.47 per share. On April 10, 2018, the Company issued our Chief Financial Officer (“CFO”) 50,000 common stock options for services, having a total fair value of approximately $52,000. 12,500 of the options vest immediately, 12,500 were to vest on April 9, 2019, 12,500 were to vest on April 9, 2020 and 12,500 were to vest on April 9, 2021. These options expire on April 9, 2023. These options have an exercise price of $1.49 per share. Of these options, 37,500 unvested options were forfeited with the departure of the CFO on December 31, 2018. On April 16, 2018, the Company issued an employee 50,000 common stock options for services, having a total fair value of approximately $47,000. 12,500 of the options vest on July 15, 2018, 12,500 vest on April 16, 2019, 12,500 vest on April 16, 2020 and 12,500 vest on April 16, 2021. These options expire on April 16, 2023. These options have an exercise price of $1.34 per share. At January 31, 2019, the aggregate intrinsic value of options outstanding and exercisable was $0 and $0, respectively. At April 30, 2018, the aggregate intrinsic value of options outstanding and exercisable was $1,000 and $0, respectively. Stock-based compensation for stock options has been recorded in the unaudited condensed consolidated statements of operations and totaled $205,726 for the nine months ended January 31, 2019 and $0 for nine months ended January 31, 2018. All warrants as of January 31, 2019 are fully vested. At January 31, 2019, the aggregate intrinsic value of warrants outstanding and exercisable was $0 and $0, respectively. At April 30, 2018, the aggregate intrinsic value of warrants outstanding and exercisable was $0 and $0, respectively. A balance of $1,137,249 remains to be expensed over future vesting periods. Net loss per common share is calculated in accordance with ASC 260, “Earnings Per Share”. Basic loss per share is computed by dividing net loss available to common stockholder, by the weighted average number of shares of common stock outstanding during the period. The following were excluded from the computation of diluted shares outstanding as they would have had an anti-dilutive impact on the Company’s net loss. In periods where the Company has a net loss, all dilutive securities are excluded. The Copper King property position consists of two State of Wyoming Metallic and Non-metallic Rocks and Minerals Mining Leases. These leases were assigned to the Company in July 2014 through the acquisition of the Copper King project. 1) State of Wyoming Mining Lease No. 0-40828 consisting of 640 acres. 2) State of Wyoming Mining Lease No. 0-40858 consisting of 480 acres. Total lease expense for the nine-month periods ended January 31, 2019 and 2018 was $2,240 and $2,240, respectively. The Company may renew the lease for a third ten-year term which will require an annual payment of $3.00 per acre and then $4.00 per acre thereafter. On October 29, 2018, the Company and Mr. Karr executed an employment agreement (the “Karr Employment Agreement”). The material terms of the Karr Employment Agreement include: (i) an annual base salary of $250,000; (ii) eligibility to earn an annual incentive bonus of up to 100% of Mr. Karr’s base salary, payable in cash or stock at Mr. Karr’s discretion; (iii) eligibility to participate in any long term incentive plan adopted by the Company; and (iv) eligibility to participate in any Company employee benefit plans. Mr. Karr is also subject to non-solicitation and confidentiality provisions set forth in the Karr Employment Agreement. On October 29, 2018, the Company and Mr. Rector executed an employment agreement (the “Rector Employment Agreement”). The material terms of the Rector Employment Agreement include: (i) an annual base salary of $180,000; (ii) eligibility to earn an annual incentive bonus of up to 100% of Mr. Rector’s base salary, payable in cash or stock at Mr. Rector’s discretion; (iii) eligibility to participate in any long term incentive plan adopted by the Company; and (iv) eligibility to participate in any Company employee benefit plans. Mr. Rector is also subject to non-solicitation and confidentiality provisions set forth in the Rector Employment Agreement. On June 27, 2016, the Company entered into an employment agreement with its Chief Geologist, Mr. David Mathewson. The initial term of the agreement is for one year, with automatic renewals for successive one-year terms unless terminated by written notice at least 30 days prior to the expiration of the term by either party. Mr. Mathewson is to receive a base salary of $200,000 per year. The base salary shall be payable as follows: (a) 25% of the base salary shall be payable in equal monthly cash installments and (b) the remaining 75% of the base salary shall be payable in equal monthly installments in the form of common stock of the Company. Each installment of common stock shall be issued on the first business day of the months and shall be valued at the market price on the trading day immediately prior to the date of issuance. Market price is the closing bid price on the principal securities exchange or trading market. Mr. Mathewson shall be entitled to receive bonus to be paid in cash, stock, or a combination thereof and equity awards. On February 19, 2019, the Company entered into contracts with investor relations firms under which it will be required to pay for services in cash and shares of the Company’s common stock. One agreement is for a six-month term and two agreements are for twelve months. A total of 155,951 shares were issued at a fair value of $160,630 based on the closing price of $1.03 on February 19, 2019 to satisfy the equity component of the agreements. On February 4, 2019, the Company issued 12,626 shares of common stock to satisfy a stock payable to an employee for services rendered during the quarter ended January 31, 2019. The shares were valued at $12,500 using a share price of $0.99 on the date of issue. In March 2019, the Company sold 54,995 common shares and raised a net of $45,932, net of issuance costs, through the ATM Agreement at $0.87 per share. This Quarterly Report on Form 10-Q contains forward-looking statements, within the meaning of the Private Securities Litigation Reform Act of 1995, that involve risks and uncertainties. Many of the forward-looking statements are located in “Management’s Discussion and Analysis of Financial Condition and Results of Operations.” Forward-looking statements provide current expectations of future events based on certain assumptions and include any statement that does not directly relate to any historical or current fact. Forward-looking statements can also be identified by words such as “future,” “anticipates,” “believes,” “estimates,” “expects,” “intends,” “plans,” “predicts,” “will,” “would,” “could,” “can,” “may,” and similar terms. Forward-looking statements are not guarantees of future performance and the Company’s actual results may differ significantly from the results discussed in the forward-looking statements. Factors that might cause such differences include, but are not limited to, those discussed under the heading “Risk Factors” in Part I, Item 1A of the Company’s most recent Annual Report on Form 10-K filed with the Securities and Exchange Commission (the “Commission”) which can be reviewed at http://www.sec.gov. The Company assumes no obligation to revise or update any forward-looking statements for any reason, except as required by law. The interim unaudited consolidated financial statements included herein have been prepared by U.S. Gold Corp. (the “Company”) without audit, pursuant to the rules and regulations of the Commission. Certain information and footnote disclosure normally included in interim unaudited consolidated financial statements prepared in accordance with accounting principles generally accepted in the United States of America (“US GAAP”) which are duplicate to the disclosures in the audited consolidated financial statement have been omitted pursuant to such rules and regulations, although the Company believes that the disclosures are adequate to make the information presented not misleading. These interim unaudited condensed consolidated financial statements should be read in conjunction with the financial statements and notes thereto in the Form 10-K filed with the Commission on July 30, 2018. In the opinion of management, all adjustments have been made consisting of normal recurring adjustments and consolidating entries, necessary to present fairly the unaudited interim condensed consolidated financial position of the Company and subsidiaries as of January 31, 2019, the results of their unaudited interim condensed consolidated statements of operations for the nine-month periods ended January 31, 2019 and 2018, and their unaudited interim condensed consolidated cash flows for the nine-month periods ended January 31, 2019 and 2018. The results of unaudited interim condensed consolidated operations for the interim periods are not necessarily indicative of the results for the full year. The preparation of interim unaudited condensed consolidated financial statements in conformity with US GAAP requires management to make estimates and assumptions that affect certain reported amounts and disclosures. Accordingly, actual results could differ from those estimates. U.S. Gold Corp., formerly known as Dataram Corporation (the “Company”), was originally incorporated in the State of New Jersey in 1967 and was subsequently re-incorporated under the laws of the State of Nevada in 2016. Effective June 26, 2017, the Company changed its legal name to U.S. Gold Corp. from Dataram Corporation. On May 23, 2017, the Company merged with Gold King Corp. (“Gold King”), in a transaction treated as a reverse acquisition and recapitalization, and the business of Gold King became the business of the Company. The Company is a gold and precious metals exploration company pursuing exploration and development opportunities primarily in Nevada and Wyoming. None of the Company’s properties contain proven and probable reserves, and all of the Company’s activities on all of its properties are exploratory in nature. On July 6, 2016, the Company filed a certificate of amendment to its Articles of Incorporation with the Secretary of State of Nevada in order to effectuate a reverse stock split of the Company’s issued and outstanding common stock per share on a one for three basis, effective on July 8, 2016. Subsequently, on May 3, 2017, the Company filed another certificate of amendment to its Articles of Incorporation, as amended, with the Secretary of State of the State of Nevada in order to effectuate a reverse stock split of the Company’s issued and outstanding common stock on a one for four basis. All share and per share values of the Company’s common stock for all periods presented in the accompanying consolidated financial statements are retroactively restated for the effect of the reverse stock splits. On July 31, 2017, Company’s Board of Directors, or Board, reviewed and approved the recommendation of management to consider strategic options for the legacy business (“Dataram Memory”) including the sale of the business, within the next 12 months. The Company sold the Dataram memory business on October 13, 2017 for a purchase price of $900,000. The Company received net proceeds from the sale of Dataram Memory business of $326,404 after payment of fees related to the sale such as legal and commission expenses and other liabilities assumed. On January 29, 2018, the Company paid a distribution of $251,316 to shareholders of record of Dataram Memory as of the close of business on May 8, 2017, or $0.2086 per share. As such, the legacy business transactions and operations are reflected on the balance sheet and statement of operations as “discontinued operation”. The Company engages in exploration activities throughout each fiscal period to advance its mineral properties. The following disclosures and discussions conform to the revised disclosure rules for mining companies as required by the Committee for Reserves International Reporting Standards (CRIRSCO). On September 7, 2018 the U.S. Federal Government’s Department of the Interior, Bureau of Land Management (BLM) approved the previously filed Environmental Assessment (EA) and Plan of Operations (POO) for U.S. Gold Corp’s 100%-owned Keystone Project on Nevada’s Cortez Gold Trend. The POO was subject to additional oversight and approval from the Nevada Department of Environmental Protection (NDEP), which was received at the end of October 2018. Exploration related disturbance and reclamation bonding is possible in multiple phases of up to 50 acres each up to a total of 200 acres. On October 10, 2018, U.S. Gold Corp received a letter from the BLM giving notice to proceed with its previously filed 2018 exploration plan. In September 2018, U.S. Gold Corp advanced an additional reclamation bond payment of $319,553 for the first 50-acre disturbance. Total reclamation bond balance on the Keystone project total $346,947. After receiving all final permits and sign offs for road work, drill pad and surface disturbance, in November 2018, U.S. Gold Corp commenced its Autumn 2018 drilling program at Keystone. During the quarter ended January 31, 2019, Gabriel E. Aliaga finished his Master of Science Thesis in Geology. Gabriel has been sponsored by U.S. Gold Corp. for the last two years. Gabriel is a Geology major at the University of Nevada, Reno, studying under Dr. Michael W. Ressel. The completed study has increased our overall understanding of the geology and opportunity of the Keystone district. There has been relatively little quality historical information data generated in the Keystone district. The studies conducted by Mr. Aliaga have provided some valuable timing information and mineral association characterization ranging from skarn mineralization to the broad, pervasive, epithermal-style mineralization. The Company believes it is exploring a complex early Tertiary gold system comparable in size and character to many of the known large gold systems. The multiple and clustered intrusives and extrusives at Keystone range in composition from intermediate to very siliceous. All of the dates from numerous samples of these intrusive and extrusive rock units are early Tertiary (Eocene) in age and range from about 36 to 34.5Ma (million years ago). Age dating of illite alteration of andesite dikes at Keystone, believed to be associated with a major gold-epithermal event, provided dates of 35.71+/- 0.12Ma, and 35.54+/- 0.06Ma. These Keystone dates compare very closely with reported mineralization-related age dates from the major Cortez Hills gold deposit to the north, ranging from 35.70 +/-0.14 to 35.31 +/-0.37Ma (Arbonies, DG, Creel, KD, and Jackson, ML, 2010, Geological Society of Nevada Symposium Volume p.457). In addition, Keystone has an important and large aeromagnetic expression of about 25sq km; this geophysical anomaly is comparable in size to those of the central and south Carlin and Battle Mountain District aeromagnetic expressions. U.S. Gold Corp. geologists believe the hydrothermal gold system at Keystone is roughly comparable in size to those within the Twin Creeks, Battle Mountain, Carlin Trend, and Cortez Districts. ● 2018 drilling, comprised of a total of fifteen holes, and was conducted in two phases. ● Phase 1 drilling provided “scout” drill tests within several broad new target areas and was limited due to permitting constraints. ● Phase 2 drilling began in early November (upon approval of the district-wide Environmental Assessment and Plan of Operations) and provided a first test to several drill targets in areas previously inaccessible due to permitting limitations. ● Numerous holes intersected significant gold assay intervals (see results table below). This program was comprised of fifteen widely-spaced, reverse circulation target assessment holes, including two holes lost prematurely: Key 18-06rc & 18-12rc, and one re-drill of a lost hole, occupying the same site: Key18-10rc and 18-11rc. All holes were drilled into several large target zones and generally served as first-pass target assessment tests. The fifteen holes comprise a total of 25,310 feet (7,714 m). All of the holes encountered moderate to thick intervals of anomalous gold with moderate to locally very strong associated pathfinder metals. Many of these also intersected significant gold assay intervals; the results of which are provided in the results table (see link below: Table 1: Summary of 2018 Keystone drill results). Nine of the fifteen holes intersected lower-plate rock units; five of these holes penetrated the permissive host Wenban Formation. Eight holes encountered variably altered permissive upper-plate Comus calcareous siltstone. Multiple target horizons exist in the district and we are encountering, and having to contend with, the daunting issue of very great combined thickness of multiple favorable target horizons along with a broad, multi-structure corridor. The total prospective host unit thicknesses at Keystone are several thousand feet. These favorable rock units are variably exposed at the surface and, or at reasonably shallow drill hole depths in the district. Carlin-style zones of alteration with containing gold and pathfinders are very widespread and are present in all locations drilled to date. Management believes the drilling at Keystone continues to show that the right ingredients are present for large gold deposits. The strong anomalous gold in the latest drill holes strengthens that belief. Finding the right structure and feeder zones that would host these large deposits becomes the focus of the Company’s 2019 program. During 2018, the Company completed detailed geological mapping over the entire district, conducted a considerable amount of fill-in gravity to tighten up identification and qualification of structures and alteration features, and infilled and added soils and rock assaying to assist in zeroing in on new and existing target opportunities. In addition, with the previously announced Master’s Thesis information, the Company is now able to make important qualifications of the intrusive rock, especially those that are considered spatially and timing-wise important to target opportunities. With the approval of the POO in September 2018, the Company acquired the ability to conduct drilling anywhere desirable on the property, will be unrestrained and able to design a drill program specific to target assessment with multiple stage drill hole follow-ups as warranted. This improves future target evaluations not previously possible. 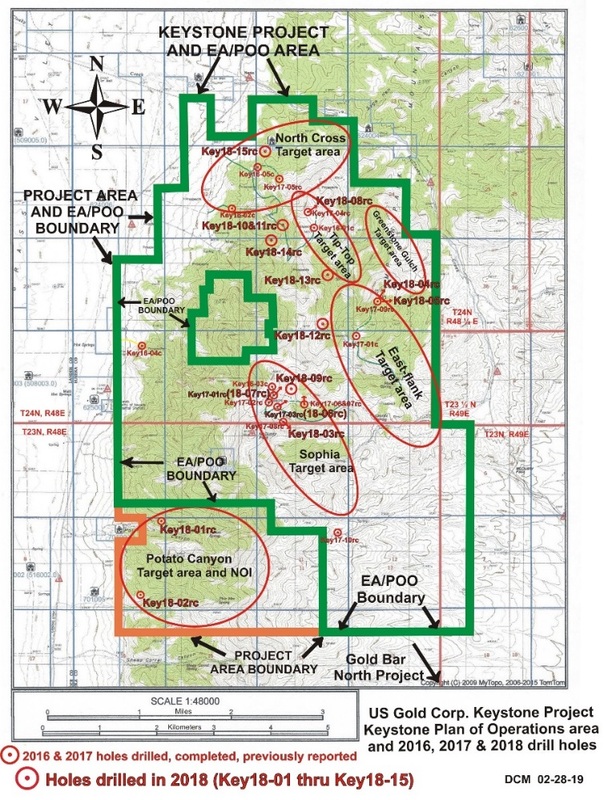 The drilling conducted to date, combined with the recently obtained and assessed geophysical and geochemical data may enable the Company to locate and qualify the gold-bearing fluid conduits that have supplied the gold to the gold-bearing mineral system that is in evidence within the Keystone district. A delay in the permitting process caused a late start to the phase 2 drilling program. The program was started in November and had to demobilize by the end of December due to the winter weather. Of the multiple targets identified, the Company was able to drill six holes, including Key18-10rc, which was lost and re-drilled at the same site with Key18-11rc, and hole Key18-12rc, which was lost above the target zone. The analysis of these six drill holes have yielded important additional information to the Company’s overall exploration efforts and ongoing target refinement. ● The Keystone District is located along the southeast extension of the Pipeline-Cortez District corridor as confirmed by the presence of an early-Tertiary complex intrusive center, widespread gold and pathfinder metal distribution, the presence of permissive host rocks of both upper- and lower-plate Paleozoic transitional carbonate rocks, the presence of a strong north-northwest-trending gravity and magnetic linear, and the spatially coincident Strontium 86/87 (.706) data generally considered to be indicative of probable source of gold along a major right-lateral north-northwest-trending suture within Proterozoic and, or Archean oceanic crustal rocks below the Paleozoic transitional host rock package. ● Multiple, Carlin-type gold deposit target settings are present within the twenty square mile area Keystone District, which is entirely controlled by U.S. Gold Corp. These targets have been and are continuing to be synthesized from large volumes of historic and newly acquired, comprehensive exploration data, including CSAMT, aeromagnetics, detailed gravity, detailed geologic mapping, and abundant new surface geochemistry. And of course, each new drill hole lends significantly toward new target synthetization and direction. ● Prospective host rocks for gold mineralization at Keystone include upper-plate Cambrian Comus Formation, comprised largely of calcareous siltstones very similar to Comus host rocks in the Getchell and Twin Creeks District to the northwest, and the lower-plate Horse Canyon, Wenban, and upper Roberts Mountains Formations of Devonian age, and the Silurian age Roberts Mountains Formation. Detailed litho-stratigraphic analyses at Keystone show that the Wenban is very similar, if not essentially identical, to the primary host Wenban unit in the Pipeline-Cortez District. The total prospective host unit thicknesses at Keystone comprise several thousand feet. These favorable rock units are variably exposed at the surface and, or at reasonably shallow drill hole depths in the District. In addition, a recently completed University of Nevada Master’s thesis, focused on the Keystone intrusive and extrusive rock units, has demonstrated the presence of a very complex, early-Tertiary intrusive/extrusive magmatic setting of very similar character and ages to those in the Cortez District just to the north. ● 2018 drilling, comprising a total of fifteen holes, was conducted in two phases, see attached map. Phase 1 provided drill tests within several broad target areas - and was limited in extent as a result of permitting constraints to this earlier point in time under the 5 acres of disturbance notice of intent (NOI) constraints. Phase 2 drilling began in early November immediately upon Bureau of Land Management (BLM) approval of the district-wide Environmental Assessment (EA) and Plan of Operations (POO). ● All fifteen holes were drilled by reverse circulation methods and sampling was conducted under the supervision of the Company’s Project Geologist, Kenneth Coleman, and generally assayed each five-foot interval split using Bureau Veritas Mineral Laboratories pulp preparation facility in Elko, NV. Resulting pulps were shipped to Bureau Veritas certified laboratory in Sparks, NV, or Vancouver BC, and analyzed for gold using fire assay fusion and atomic absorption spectroscopy (AAS) finish on a 30-gram pulp split. All other elements were determined by ICP analyses. Data verification of the analytical results included a statistical analysis of the standards and blanks that must pass parameters of acceptance. On February 21, 2019, the Company announced that Datamine of Denver, CO, completed a comprehensive drill hole analysis of the Company’s Copper King gold-copper-silver-zinc deposit, located in Southeast Wyoming. Datamine included all of the historic drilling database and the step-out drill programs conducted by U.S. Gold Corp. in 2017 and 2018 that successfully encountered additional mineralization and expanded the deposit to the west and southwest. The Datamine model shows that the deposit remains open to the southwest and also to the southeast and appears to have a curved configuration as opposed to a more confined, previous west-northwestward tabular configuration. A Preliminary Economic Assessment (PEA) for the historic Copper King deposit was conducted by Mine Development Associates (MDA) and reported January 11, 2018. This PEA provides a Pre-Tax NPV of $178.5 million and an IRR of 33.1%, based on $1275/oz Au and $2.80/lb Cu. The PEA does not include the additional mineralization from the 2018 western step out drilling that has enlarged the deposit size and metal content. The PEA also does not include the values of other metals inherent to the deposit, including zinc and silver. Datamine’s exploration model does include the 2018 drilling conducted by U.S. Gold Corp. The Datamine exploration model also illustrates various isoshells for gold, copper, silver and zinc (see link below). The Company plans to utilize this new, updated digital exploration model to assist with a future drilling program that it believes is a high-probability opportunity to discover additional prospective ore extensions. The Company also plans to further explore for and characterize the high-grade target zones of mineralization within the deposit. The Company is currently reviewing all the conclusions from the Datamine model and will develop additional 2019 exploration programs based upon the results. The Company is also currently re-examining all existing regional exploration data for the purpose of identifying additional new target opportunities in the vicinity of Copper King. The Company is an exploration stage company with no operations, and we generated no revenues for the nine months ended January 31, 2019 and 2018. The Company is an exploration stage company with no operations, and we generated no revenues for the three and nine months ended January 31, 2019 and 2018. Total operating expenses for nine months ended January 31, 2019 as compared to nine months ended January 31, 2018, were approximately $6.1 million and $6.6 million, respectively. The approximate $530,000 decrease in operating expenses for the nine months ended January 31, 2019 as compared to nine months ended January 31, 2018 is comprised principally of decreases in compensation expense of $329,000, professional fees of $346,000 and general administrative expenses of $121,000, offset by an increase of approximately $267,000 in exploration expenses on our mineral properties. The increase in exploration expenses was planned as part of the Company’s Autumn drill program and resulted in significant important findings as described above in the Drill Results at Keystone Property and Drill Hole Analysis at Copper King described above in Exploration Activities. Total operating expenses for three months ended January 31, 2019 as compared to three months ended January 31, 2018, were approximately $1.6 million and $1.8 million, respectively. The approximate $133,000 decrease in operating expenses for the three months ended January 31, 2019 as compared to three months ended January 31, 2018 is comprised of an decrease of approximately $195,000 in exploration costs, which is mainly attributed to an decrease in consulting expenses and drilling expense, and a decrease of $45,000 in general and admin expense due to reduced insurance expense and travel and related expenses. These amounts were somewhat offset by a $94,000 increase in compensation expense and $13,000 increase in professional fees due primarily to costs incurred to prepare for the ATM financing. Costs identifiable as direct issue costs of the financing itself have been charged to Additional paid-in capital to reduce the proceeds of the financing. We reported an operating loss from continuing operations of approximately $4.5 million and $4.9 million for the nine months ended January 31, 2019 and 2018, respectively. We reported an operating loss from continuing operations of approximately $3.0 million and $1.7 million for the three months ended January 31, 2019 and 2018, respectively. In June 2017, subsequent to the Merger, the Company decided to discontinue its memory product business. The Company subsequently focused its activities on its gold and precious metal exploration business. The following table sets forth for the nine months ended January 31, 2018, indicated selected financial data of the Company’s discontinued operations of its memory product business from the date of merger to January 31, 2018. The following table sets forth for the three months ended January 31, 2018, indicated selected financial data of the Company’s discontinued operations of its memory product business from the date of merger to January 31, 2018. As a result of the operating expense and other expense discussed above, we reported a net loss of approximately $6.6 million for the nine months ended January 31, 2019 as compared to a net loss of $12.5 million for the nine months ended January 31, 2018. As a result of the operating expense and other expense discussed above, we reported a net loss of approximately $2.1 million for the three months ended January 31, 2019 as compared to a net loss of $1.8 million for the three months ended January 31, 2018. As of January 31, 2019, we had working capital of $3,166,869 as compared to working capital of $7,992,236 as of April 30, 2018, a decrease of $4,825,367. During the year ended April 30, 2018, we received proceeds of approximately $4.9 million from the issuance of preferred stock and warrants and $2.6 million from the issuance of common stock. The Company used the proceeds primarily to fund operations during the nine months ended January 31, 2019 and year ended April 30, 2018 and pay asset acquisition costs during the year ended April 30, 2018. We are obligated to file annual, quarterly and current reports with the SEC pursuant to the Securities Exchange Act of 1934, as amended (the “Exchange Act”). In addition, the Sarbanes-Oxley Act of 2002 (“Sarbanes-Oxley”) and the rules subsequently implemented by the SEC and the Public Company Accounting Oversight Board have imposed various requirements on public companies, including requiring changes in corporate governance practices. We expect these rules and regulations to increase our legal and financial compliance costs and to make some activities of ours more time-consuming and costlier. We expect to spend between $200,000 and $250,000 in legal and accounting expenses annually to comply with our reporting obligations and Sarbanes-Oxley. These costs could affect profitability and our results of operations. The Company’s unaudited condensed consolidated financial statements are prepared using the accrual method of accounting in accordance with accounting principles generally accepted in the United States of America (“U.S. GAAP”) and have been prepared assuming that the Company will continue as a going concern, which contemplates the realization of assets and the settlement of liabilities in the normal course of business. For the nine months ended January 31, 2019 and the year ended April 30, 2018, the Company has incurred losses in the amounts of approximately $6.6 million and $12.5 million, respectively. As of January 31, 2019, the Company had cash totaling approximately $3.2 million. During the year ended April 30, 2018, The Company completed private placements to several investors for the sale of the Company’s common stock for aggregate net proceeds of approximately $2.6 million between July 2017 and October 2017 and completed a private placement to several investors for the sale of the Company’s Series E Preferred Stock and warrants for aggregate net proceeds of approximately $4.9 million in January 2018. Cash flows from financing activities continued to provide the primary source of our liquidity. The Company will need to raise additional capital to support its continuing operations but there can be no assurance that it will be able to do so or if the terms will be favorable. The unaudited condensed consolidated financial statements do not include any adjustments relating to the recoverability and classification of recorded assets or the amounts of and classification of liabilities that might be necessary in the event the Company cannot continue in existence. Management has determined that additional capital will be required to continue its operations. There are no assurances that management will be able to raise capital on terms acceptable to the Company. If we are unable to obtain sufficient amounts of additional capital, we may be required to reduce the scope of our planned exploration activities, which could harm our business, financial condition and operating results. If we obtain additional funds by selling any of our equity securities or by issuing common stock to pay current or future obligations, the percentage ownership of our stockholders will be reduced, stockholders may experience additional dilution, or the equity securities may have rights preferences or privileges senior to the common stock. If adequate funds are not available to us when needed on satisfactory terms, we may be required to cease operating or otherwise modify our business strategy. On November 2, 2018, the Company entered into an At-the-Market Offering Agreement (the “ATM Agreement”) with H.C. Wainwright & Co., LLC (“Wainwright”) as sales manager. Under the terms of the ATM Agreement, the Company will be entitled to sell, at its sole discretion and from time to time as it may choose, common stock of the Company (“Shares”) through Wainwright, with such sales having an aggregate gross sales value of up to $1,000,000 (the “Offering”). The ATM Agreement will remain in full force and effect until the ATM Agreement is terminated. For the quarter ended January 31, 2019, the Company has sold 235,071 Shares and raised a net of $178,872, net of issuance costs, through the ATM Agreement. The above financing transactions have increased the Company’s overall cash position. Additionally, the Company is able to control cash spending on its variable exploration activities. As a result, as of the date of the issuance of these condensed consolidated financial statements, the Company believes its current cash position and plans to raise additional capital have alleviated substantial doubt about its ability to sustain operations through at least the next 12 months. Net cash used in operating activities totaled $4.6 million and $6.3 million for the nine months ended January 31, 2019 and 2018, respectively. Net loss for the nine months ended January 31, 2019 and 2018 totaled approximately $6.6 million and $12.5 million, respectively. The adjustments for the non-cash items decreased from the nine months ended January 31, 2018 to January 31, 2019 due primarily the non-recurrence of 2018 impairment expenses of approximately $6.1 million. Additionally, the Company expensed $1.3 million in stock-based compensation for options and shares issued to employees, consultants and suppliers earlier in fiscal year 2019. The Company also established a reserve for the entire balance of a $438,000 deferred tax asset due to the unlikelihood it will be utilized in the foreseeable future to offset tax liabilities. Net changes in operating assets and liabilities are primarily due to net decreases in cash of approximately $4.5 million and net increases in reclamation of bond deposits of approximately $254,000, offset by a decrease of $419,000 in prepaid expenses for investor relations and consulting expenses expensed and a decrease of $69,000 in trade accounts payable and an increase of $29,000 in accounts payable to related parties in the nine months ended January 31, 2019. Net cash provided by investing activities totaled $0 and $306,000 for the nine months ended January 31, 2019 and 2018, respectively. During the nine months ended January 31, 2018, cash provided by investing activities consisted of net proceeds of $326,000 from the sale of a business previously treated as a discontinued operation and $20,000 cash invested in a note receivable. Net cash provided by financing activities totaled approximately $179,000, net of issuance costs, for the nine months ended January 31, 2019 from the issuance of common stock for cash under the ATM agreement. During the nine months ended January 31, 2018, cash provided by financing activities consisted of net proceeds of approximately $4,919,000 from the issuance of preferred stock and warrants and approximately $2,590,000 from the issuance of common stock. On February 19, 2019, the Company entered into contracts with investor relations firms under which it will be required to pay for services in cash and shares of the Company’s common stock. One agreement is for a six-month term and two agreements are for 12 months. A total of 155,951 shares were issued at a fair value of $160,630 based on the closing price of $1.03 on February 19, 2019 to satisfy the equity component of the agreements. The Company does not have, and do not have any present plans to implement, any off-balance sheet arrangements. Refer to the notes to the unaudited condensed consolidated financial statements. In preparing the unaudited condensed consolidated financial statements, management is required to make estimates and assumptions that affect the reported amounts of assets and liabilities as of the date of the balance sheet, and revenues and expenses for the period then ended. Actual results may differ significantly from those estimates. Significant estimates made by management include, but are not limited to valuation of mineral rights, goodwill, stock-based compensation, the fair value of common stock issued, asset retirement obligation and the valuation of deferred tax assets and liabilities. Stock-based compensation is accounted for based on the requirements of the Share-Based Payment Topic of ASC 718 which requires recognition in the financial statements of the cost of employee and director services received in exchange for an award of equity instruments over the period the employee or director is required to perform the services in exchange for the award (presumptively, the vesting period). ASC 718 also requires measurement of the cost of employee and director services received in exchange for an award based on the grant-date fair value of the award. Pursuant to ASC Topic 505-50, for share-based payments to consultants and other third-parties, compensation expense is determined at the measurement date which is the grant date. The expense is recognized over the vesting period of the award. Until the measurement date is reached, the total amount of compensation expense remains uncertain. We maintain disclosure controls and procedures that are designed to ensure that material information required to be disclosed in our periodic reports filed under the Securities Exchange Act of 1934, as amended, or 1934 Act, is recorded, processed, summarized, and reported within the time periods specified in the Commission’s rules and forms and to ensure that such information is accumulated and communicated to our management, including our chief executive officer and principal financial and accounting officer as appropriate, to allow timely decisions regarding required disclosure. We carried out an evaluation, under the supervision and with the participation of our management, including the principal executive officer and the principal financial and accounting officer, of the effectiveness of the design and operation of our disclosure controls and procedures, as defined in Rule 13(a)-15(e) under the 1934 Act, as of the end of the period covered by this report. Based on this evaluation, because of the Company’s limited resources and limited number of employees, management concluded that our disclosure controls and procedures were not effective as of January 31, 2019. 1. The hiring of an outside consulting firm and Chief Financial Officer with extensive experience in documenting, designing, testing and analyzing controls over financial reporting. to assist in preparation of Company’s financial statements and provide reasonable assurance that transactions are recorded as necessary to permit preparation of financial statements in accordance with U.S. GAAP, and that receipts and expenditures are being made only in accordance with authorizations of Company’s management and directors. 2. Starting the process of documenting its control environment. On November 1, 2018 Robert DelAversano resigned from his position as Principal Financial and Accounting Officer of the Company to pursue other opportunities. Mr. DelAversano served as the Principal Financial and Accounting Officer pursuant to a consulting agreement between the Company and Brio Financial Group, where Mr. DelAversano serves as Director of Financial Reporting & Taxation. On November 1, 2018 the Company appointed Jonathan Tegge, age 29, as its Principal Financial and Accounting Officer. Mr. Tegge served as the Principal Financial and Accounting Officer pursuant to a consulting agreement between the Company and Brio Financial Group, where Mr. Tegge serves as an Associate of Financial Reporting. Jonathan Tegge resigned as Chief Financial Officer effective January 1, 2019, to pursue other opportunities. The Company has engaged a new consulting firm headed by a Certified Public Accountant with several years of experience as a Chief Financial Officer of public companies. Effective on January 1, 2019, the Company appointed Ted R. Sharp as its Chief Financial Officer and designated Principal Financial and Accounting Officer. There have been no other changes in our internal control over financial reporting except as mentioned above that occurred during the period covered by this Quarterly Report that have materially affected, or are reasonably likely to materially affect, our internal control over financial reporting. There have been no material changes to the Risk Factors in Item 1A of our Annual Report on Form 10-K for the fiscal year ended April 30, 2018. During the three months ended January 31, 2019, the Company issued 37,500 shares of the Company’s common stock to the Chief Geologist for services rendered to the Company from November 2018 to January 2019 pursuant to his employment agreement. 31(a) Rule 13a-14(a) Certification of Edward M. Karr. 31(b) Rule 13a-14(a) Certification of Ted R. Sharp. 32(a) Section 1350 Certification of Edward M. Karr (furnished not filed). 32(b) Section 1350 Certification of Ted R. Sharp (furnished not filed).